This govt came on a inclusive development program. There was no need to allow the extreme right wing fringe to go on riot in the country. And with such large popularity and all opinion polls predicting victory ( though I still believe this may fail spectacularly), who would have thought the rafale deal will come back to haunt them !! And a great opportunity lost for our people !! The WB act also prescribes punishment for false and frivolous complaints. At the moment , we don't know the truth, as the matter is sub judice. But the Govt's position is clear that this is a false complaint. Moreover the Govt has made a serious charge that important official docs are stolen.We don't know how many and what other important docs are stolen, and for how long this stealing has been going on etc. So it is incumbent upon the Govt to order a detailed investigation into how secret documents are "stolen" and to plug any lapses in the process. Note that this is not the same as victimizing the whistle blowers. Good question. Now let us say, I am an employee of the said company, and I am approached by a journalist who wants a scoop to impress his bosses and readers. In return for certain monetary benefits from the Media powerhouse, I steal certain Important Company documents that might compromise it's relationship with its clients. Now, the country is no stranger to false litigation. A study has shown that roughly 90% of the cases in the various courts in the country, end up false or unproven. There are perjury laws but they are rarely invoked, for fear that if people start getting more truthful on courts, the lawyers' livelihood will get severely impacted. 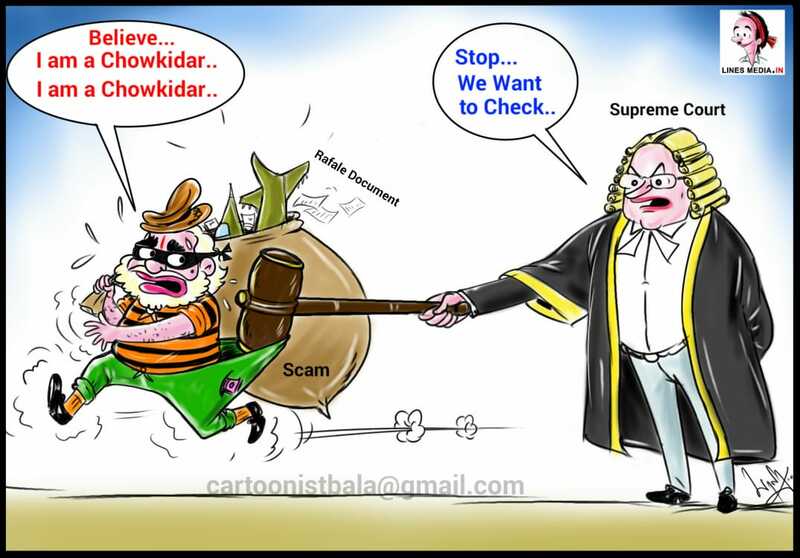 Under the circumstances, even if the said media house make a false allegation of corruption against my employer, by misusing the documents that I helped steal from it, there is not much that my employer can really do, firstly since litigation in courts is always time consuming, secondly the company will be afraid of any bad publicity. So it might prefer to settle the matter with the media house out of court. Now, was there corruption? Yes, the media house gave me money in exchange for information. Was I punished? No, because the WB act protects me, since the falsity of the allegation has not been proved, as the matter has been settled elsewhere. I just wrote some of my random thoughts on the matter. Rather than hypothesize further, I would prefer to wait and watch further developments in the case. I hope you will agree that the law should always be on the side of the "small guy", in this case the employee or whistle blower or the lone journalist !! So instead of penalising the journalist for exposing the rafale documents, the govt should be held responsible for the rafale procedural violations !! Freedom of press is more important for survival of democracy !! In a parallel development, Julian Asange has been arrested with the entire might of the USA and UK govts which goes against the freedom of press !! I think the law cannot take sides. But it does insist that everyone, especially the underdog, has the right to be heard which cannot be taken away by anyone. I absolutely agree that the press should not be gagged. If the press comes across evidence incriminating anyone, it has all the right to spread that news with everyone. But if the evidence is procured through illegal means, can the law shut it's eyes on that aspect? I think no. Else that would be counterproductive - a blatant encouragement to go against the very law! Imho these two aspects - the freedom of the press, and the binding on common citizen to not do anything illegal, need to be seen differently. But if the evidence is procured through illegal means, can the law shut it's eyes on that aspect? I think no. Else that would be counterproductive - a blatant encouragement to go against the very law! The issue of evidence procured through illegal means are covered by the "Doctrine of Fruits of a Poisonous Tree". This doctrine though well established in USA and some other countries is not set as a "doctrine" in Indian judicial system yet. It is unlikely that this point will be stressed as the present issue is "Judicial Review". The Government was within its right to argue in the Court that no new evidences other than the original brief based on which the original judgement was delivered; but given the vicious political climate prevailing, the Government should not have adduced this argument which sounds technical and allowed the arguments to proceed on merits. Thanks for sharing hat very interesting piece of legal terminology. I did a google search and came across an explanation of the doctrine as well as covering the below exclusions. or if there is attenuation between the illegal activity and the discovery of the evidence. The evidence was collected illegally but admissible under the good faith exceptional clause. So, for argument's sake, even if the doctrine is cited by the Govt, the petitioners could try to interpret things according to any of the above exclusions, I think. But the source, and the legality of the activity, can be known only through an investigation, since the petitioners themselves have not revealed it. So has the Govt ordered an investigation into how documents got stolen, and fix responsibility? The WB act might help protect the petitioners from Govt action, but I think that does not prevent the Govt itself from investigating. The Govt has argued that the documentary evidence placed before Court are incomplete and show a biased picture of the negotiations. Despite it being a review petition, the Court has now allowed these documents as evidence. Do you think that the Govt would now place additional documents from its side before the Court, in the interests of justice ? Since this point is important, I will touch upon this first. "The Hindu" has resorted to what is known as "cropping" of documents; that is blocking out portions of documents and file notations which runs contra to its position on the issue. The Hindu made it appear the cut offs are due omissions in xeroxing the documents but it did not cut ice and there was a plethora of objections. Resultantly Hindu was forced to issue an addendum where it tried to justify its "news cropping" which again was not convincing. This is what has been pointed out by our Raksha Mantri as "selective reporting". The Government may place the document in original or a certified copy of it of the "cropped document" relied upon by the Hindu. There is nothing special in the Hindu document. If you observe the change of narrative of petitioner, you will notice that from "mega corruption in Rafale" and "undue favour" to Anil Ambani, it has moved to "parallel negotiation by PMO". What Hindu knows but wont say is Rafale is Government to Government transaction between India and France and PMO is nodal agency for monitoring the progress of the deal with the President of France and a sundry defence secretary cant be communicating with the French President, so keeping the PMO in the loop can hardly be termed as interference as these people would like to believe. Supreme Court in its original order has already stated that the process is transparent and the usual norms and procedures have been followed. There is nothing in The Hindu documents to suggest there is any travesty in the standard operating procedure. You have queried " Do you think that the Govt would now place additional documents from its side before the Court, in the interests of justice ?". There has never been an argument of injustice to anyone. It is the wish of the opposition and media houses that support the narrative of the opposition to try to throw all the muck at the incumbent government and see if anything can be made to stick which is not happening currently. Even Rahul Gandhi has moved on from Rafale topic to nyay etc. because it has absolutely no traction with the voting public. As I said before, the matter before the Court is Review Petition where the Court is prayed to review its own judgement because of lacuna of logic or omission of weighing in evidences in the original order. When the newly introduced document is admitted as evidence, the Court will not engage itself in the "interpretations" which you presume the petitioner to advance. We will have to wait for some other occasion, like the Government charge-sheeting some officials for making available these documents to people non-competent to possess them. What the Government representative (SG/ASG) said in the court was that the documents were covered under Official Secrets Act. So the whistle blower etc. are not applicable here, only OSA. What is decided by the Court when someone is charged under OSA, is whether OSA is supreme or RTI Act is supreme. I expect this Government to plug the loopholes if elected back to power, because leakage of documents are happening in a torrent. You may like to follow the twitter handle of @barandbench (Bar & Bench) to get unadulterated and unbiased observations, judgements and pronouncements made by the Supreme Court rather than getting "cropped news" from news portals. During the hearing prior to passing the original order, did the Govt refer to the existence of certain other documents that, it is not allowed to place in court due to privilege? Perhaps that was taken for granted. If so, that could have weighed in on the Judiciary while taking this step of admitting fresh evidence during review. In any case, I think, now that SC has ruled on the supremacy of RTI act over OSA it is now incumbent upon the Govt to come clean with all documents even remotely connected with the deal. I was under the impression that a partial set of documents, that by themselves, could possibly influence the SC into making a wrong judgment against the Govt, were placed by the petitioners in Court. So I said "in the interests of justice", let the Govt share the "full" set of documents and let the Court decide the rest. Your message that it was a cropped set of documents, of course clarified it. Thanks for the details. "verdict" in the Rafale matter. Media is mostly after sensationalism. But in election time, you might see developments on a daily basis, like the below. BJP MP Meenakshi lekhi in her plea said that after the Supreme Court's ruling in Rafale deal, Rahul Gandhi misquoted the top court and tried to create prejudice. The issue of evidence procured through illegal means are covered by the "Doctrine of Fruits of a Poisonous Tree". This rule is only applied to prosecution. Like the exclusionary rule, the fruit of the poisonous tree doctrine is intended to deter police from using illegal means to obtain evidence. There are a lot more to it. You have to google for additional information. Udjal gagri chalakat jaye, part knowledge is dangerous. Some arguments looks like that Even before the girl is pregnant, guessing as to boy or girl and fixing a date for naming ceremony. Now the Court has ordered that the documents published in the Hindu should also be looked into. Whether the Govt will produce any other documents to defend its case? The matter is in a primitive stage. We should not come to conclusions even before the Judges have decided on the case. It is wishful thinking that the Govt will fall as soon as the judges decide. (What will be the judgment do we know?) It is overenthusiasm and wishful thinking. In Bofors case what happened ? Whether the Govt fell ? Anybody indicted. ? From President to MLAs before taking charge they have to take oath of secrecy. Whether Journalists don’t have the responsibility to safeguard the interests (security) of the Country. In the name of investigative journalism, are they correct to bring it to the public knowledge details relating to our defence (eg., that our defence is weak in one or the other part of the country.) Can any Govt allow a document to be photocopied and circulated ? At the same time any wrong doing has to be exposed. Only the highest judicial body can draw a line with respect to the rights and responsibilities of investigative journalism. In our healthy discussion there is no question of right wingers and left wingers. Emotions should not play in healthy discussions. 1. Serious conflict of interest when the offset contract was given to Ambanis. 4. Escrow and bank garauntee clauses removed. 5. Ambani accompanying the PM and his team to France. 6. Many other clauses removed and undue favours as per Hindu report. Now this is a clear case of serious conflict of interest, defence ministry procedural violation, and undue favours to a contractor for a govt that came on a massive anti corruption agitation and wave !! If the Hindu report is based on defence documents and if the authenticity is proved, then the court has no choice but to order an investigation. Again, no one I saying the govt is guilty, all the petitioners are asking is for an "investigation" to be ordered. Politically, this will be a death knell for this govt, if an investigation is ordered on possible corruption in this deal. Quoting French newspaper, Le Monde, at a media conference, Congress spokesperson said: "Between February and October 2015, while the French were negotiating the Rafale contract with India, Anil Ambani enjoyed a tax waiver of 143.7 million euros from the French state." "The French tax authorities who had earlier demanded close to 150 million euros from the Reliance-owned company, Reliance Atlantic Flag France, agreed to settle the matter with just 7.5 million euros, the rest of the demand was simply waved, and this is Le Monde's claim, not mine".